I love a dish that looks like it took forever to prepare, when in fact only took a little over an hour. And has a little spice … or as much as you’d like to add according to your tastebud threshold. This one is versatile. And delicious! The rub is a make-it-as-you-like-it mixture. 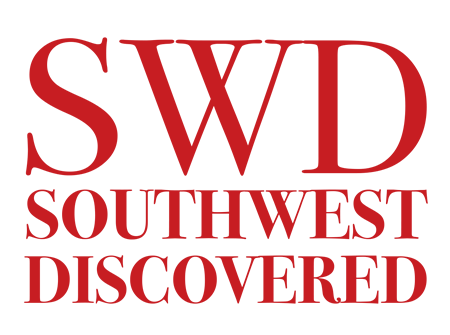 Since everyone in the Southwest develops their own recipe, mine is a good starting point with pure New Mexican red chile powder (Chile Rojo), cumin, coriander, oregano, garlic powder, onion powder, salt, black pepper and cayenne. And the beauty is … wing it. 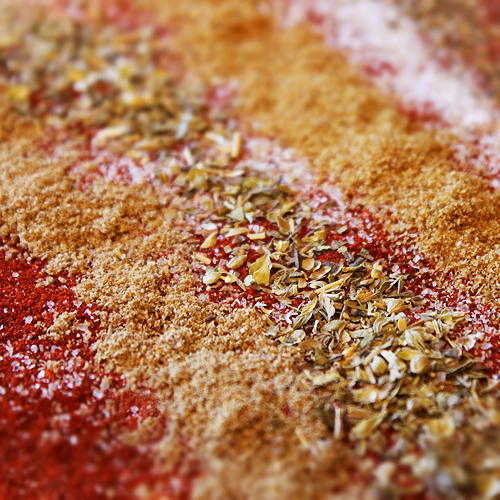 Taste as you go … more cayenne, no garlic, more salt. You’ll know when you know, you know? This Valentine’s Day, rather than large cuts I’ve chosen two petite filets because this dish is rich and I’d like to leave room for dessert rather than overindulging and having my chocolate souffle for breakfast the next day. 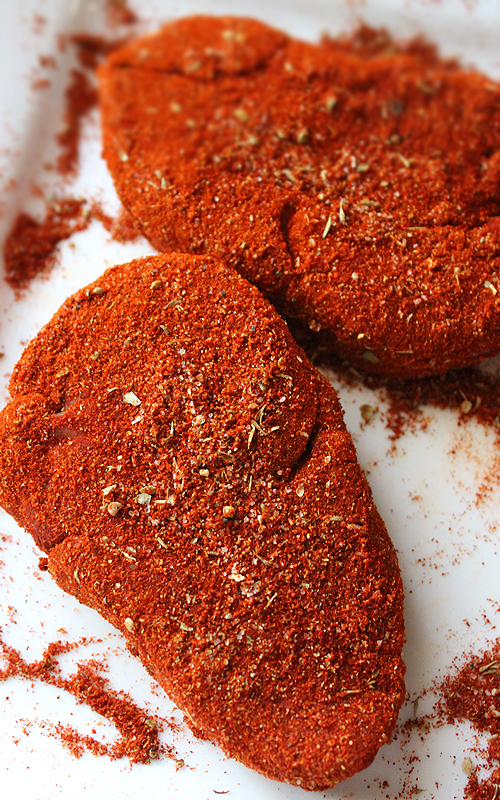 The spice rub coats all sides, then they go into a grill pan with olive oil and butter, cooked to your desired temperature. 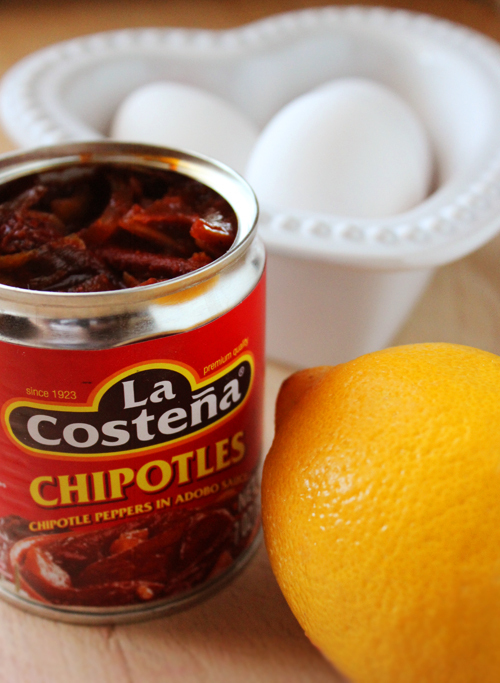 Blend egg yolks with lemon juice, a little mustard, salt and pepper, with the juicy sauce from chipotles in adobo. Then drizzle in 1/2 cup hot butter … slowly … slowly … and it becomes a smooth thick consistency. Perfect every time with no whisking or opportunity to scramble. Note: the adobo heat can sneak up on you, so start with a scant tablespoon and add teaspoon by teaspoon until it’s just right. Or if you’re like my friend Chile Sage, pour in half the can… you can take it because this is what you were spoon fed as a toddler. For the steaks I combined my red chile with more of the adobo and some drippings from the grill pan. 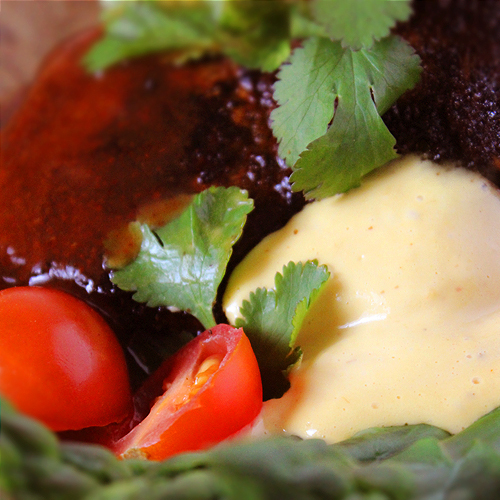 Another spiced up option is red enchilada sauce, homemade or a good quality canned brand. 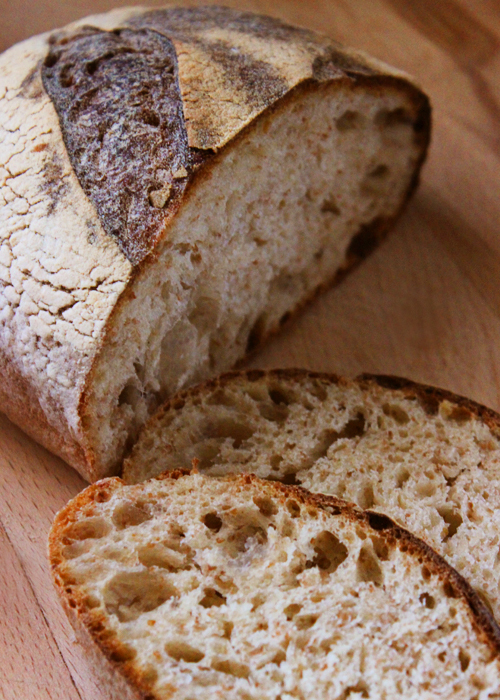 I got this gorgeous loaf of country bread from a local Durango bakery called Bread … a no shortcuts artisan gem… the best. Their mottos: Bread not Bombs. Bring cash, we don’t trade in plastic. And ride a bike, it’s good for you. Wishing you Buen Provecho and lots of lovey time! Red Sauce Options: A red enchilada sauce, red chile, or red chile mixed with pan drippings and a tablespoon of chipotles in adobo sauce. The steaks should come to room temperature within a half hour. Mix all of the spices and then generously coat the filets. Using a stovetop grill pan, bring the olive oil and butter to medium high heat. Cook the steaks 4 minutes per side or to your preference, spooning the pan drippings over them a few times. Note: They will blacken a bit from the rub. Move them to a plate, cover with foil and let rest 8 - 10 minutes before plating. Reserve the pan drippings in case you'd like to use in a red sauce. I combine my red chile with the drippings along with 1 tablespoon juices from a can of chipotle in adobo sauce. Top with tomatoes and cilantro. 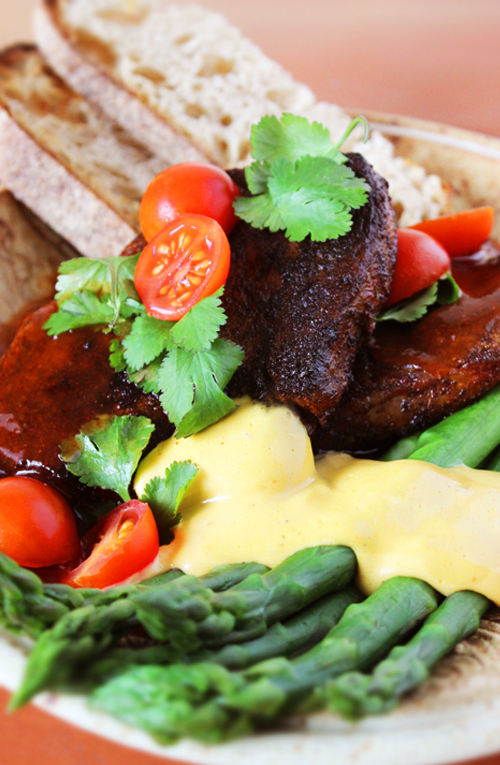 Add into a blender: egg yolks, lemon juice, adobo sauce, mustard, salt and pepper. Turn on to 'blend' and begin drizzling in the melted butter, very slowly. The consistency will become thickened and smooth. Taste for additional salt and adobo. Also great for Southwest Eggs Benedict and over other vegetables. I will be sure to try this one. Thanks Jen! It’s one of my very favorites. 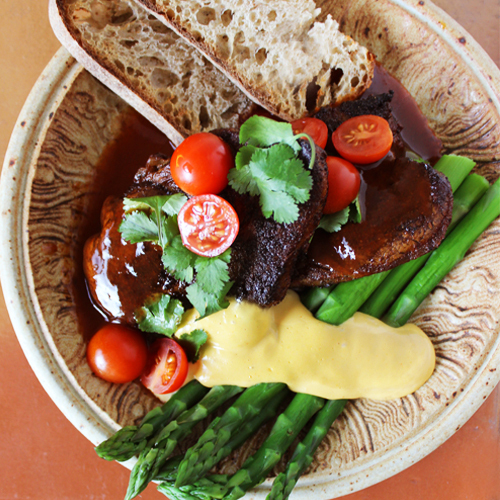 The steaks become blackened and so flavorful + the blender hollandaise … it’s a no fail!